Business conferences have the unfortunate reputation of being dry and boring, but it doesn’t always have to be this way. If you’re in charge of planning your company’s next big conference, take a look at these three creative tips to help transform the event from bland to grand. Event lighting can quickly and efficiently add the wow factor to any event – even the most sedate meetings and conferences. Just because the subject matter is serious, it doesn’t mean you have to stick to stark white lighting at your venue. Instead, get creative with washes of coloured light against walls, or use spotlights to emphasise key speakers and guests. You could also project a monogram or your business’s logo against walls in bright colours. There are down periods in all conferences where no one’s speaking and nothing much is happening, even if the audience is just waiting for the next guest to enter the stage. These moments are key opportunities for you to rejuvenate your audience and get them energised. One way to do this is by playing uplifting music. Music has long been used as a motivational tool, and certain types of music can foster different types of atmospheres. Use a good quality audio system to project sound to your whole audience during lunch breaks and periods where guests aren’t speaking. You could even hire a live band to entertain the crowds if you want to really pump them up! Never underestimate the power of quality entertainment. Not every moment of your conference needs to be dedicated to serious business speak, and a bit of light relief is the perfect way to break up a formal conference. Musical guests are always well received, but you could go one step further and hire dancers, gymnasts, magicians or other talented groups to take the stage and give your audience a break from the serious business of a conference. Pro Light & Sound are the experts in working with event managers to help create unforgettable corporate events. 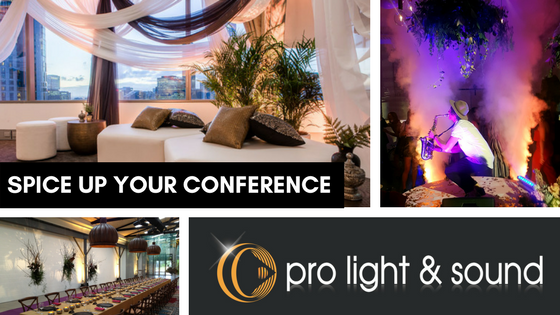 If you are planning your next conference, get in touch with a Pro Light & Sound expert. You have just shared a very useful information on setting up a conference. Whether it is for a meeting or training, proper lightning and sounds make the difference. Even a simple location like a gymnasium or a big library can be a good venue. And yes, adding up cool music will be more entertaining.